Your Princess will love bouncing with her Disney Princess friends in this colorful fully covered Disney Princess Bounce House. Every little girls dream to be a princess among her favorite princesses. 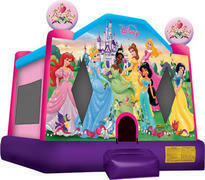 Perfect for any girly and or princess party fun. Your little girl will feel like royalty.